Before Alexandria Marzano-Lesnevich begins a summer job at a law firm in Louisiana, working to help defend men accused of murder, she thinks her position is clear. The child of two lawyers, she is staunchly anti-death penalty. But the moment convicted murderer Ricky Langley’s face flashes on the screen as she reviews old tapes―the moment she hears him speak of his crimes―she is overcome with the feeling of wanting him to die. Shocked by her reaction, she digs deeper and deeper into the case. Despite their vastly different circumstances, something in his story is unsettlingly, uncannily familiar. 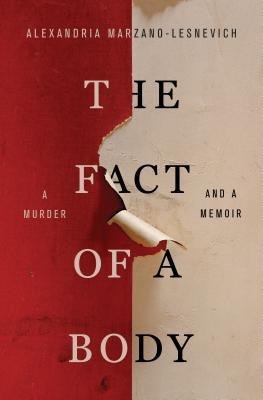 An intellectual and emotional thriller that is also a different kind of murder mystery, The Fact Of a Body is a book not only about how the story of one crime was constructed―but about how we grapple with our own personal histories. Along the way it tackles questions about the nature of forgiveness, and if a single narrative can ever really contain something as definitive as the truth. This groundbreaking, heart-stopping work, ten years in the making, shows how the law is more personal than we would like to believe―and the truth more complicated, and powerful, than we could ever imagine. Though I read a ton of mystery/thrillers it’s been quite awhile since I’ve picked up a true crime book. I went through a phase in high school where I read many of them, but oftentimes I felt like they were dry and a little boring. But when I first read the blurb for The Fact of a Body I was immediately intrigued. How could a true crime book merge with a memoir when the author wasn’t directly involved in the case?! After reading this amazing book I can say that she manages to weave the two seemingly unrelated tales beautifully and seamlessly. The book alternates between various timeframes both from Ricky’s past and also the authors. At times it read like a legal thriller, at others it was like getting a harrowing look at the lives of both. Ricky did not have an easy upbringing and though the crimes he committed make me sick to my stomach, ML does a fantastic job of examining what shaped him. She describes her journey of self discovery as she revisits her own extremely painful past and explains why she was so drawn to and so connected to the case. Her writing style was outstanding, she’s truly gifted and had me simultaneously captivated and haunted by what she was saying. The truth is dissected and reexamined revealing that nothing about this story can be defined in black and white terms but that the truth lies somewhere in shades of gray. Knowing that this was based on true events made it all the more chilling and when I finished I went straight to Google. I read several news articles about the various trials and I watched videos, but not many as watching Ricky’s confession was about all I could handle. As much as I was impressed by this book I do want to warn people that there are many instances where abuse against children is discussed and though ML doesn’t sensationalize it at all, it’s still disturbing to read. If you can handle that, this is such a phenomenal read, very intelligent and written so sensitively. Nice review. I really liked the first two thirds of this book, but the last third just dragged. I thought both stories were fascinating but could have been told without quite so much detail. I can see that! It was such a different read. Great review! This is on my list to read on Netgalley. I can’t wait! I haven’t read any true crime for quite a while, but this one sounds interesting. Although, it may be a little too real for my taste. Thanks for the warning. It was excellent but disturbing. It’s a thought-provoking and hard-hitting novel, quite an experience to read! Excellent review ! What a intriguing spin on the true crime genre! As much as I am curious to know how the author and Ricky’s stories collide, you already know I’m out since it deals with violent crimes against children. Lovely review as always Amy! Oh man yeah, this was pretty brutal! It bothered me quite a bit but she was such a great writer it was worth it for me.